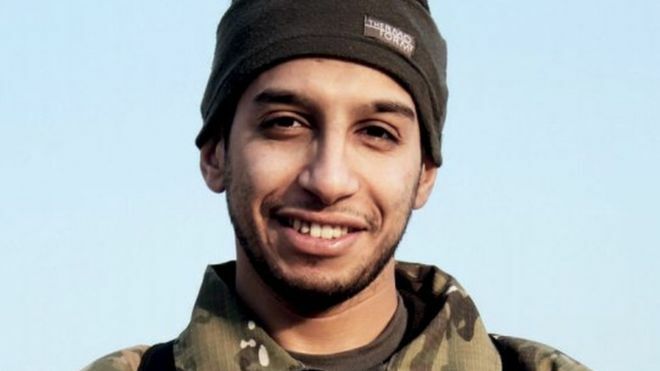 The suspected ringleader of the Paris attacks, Abdelhamid Abaaoud, has been identified as one of those killed in Wednesday’s raid in the suburb of Saint Denis, the Paris prosecutor says. His body was found riddled with bullets and shrapnel in a shattered apartment in the northern suburb. The Belgian national, 28, was identified from his fingerprints. Eight people were arrested and at least two killed in the raid on the property in Saint Denis. Heavily armed police stormed the building after a tip-off that Abaaoud was in Paris. A woman at the flat – reported in French media to be Abaaoud’s cousin – died during the raid after activating a suicide vest. The prosecutor’s office said it was still unclear whether Abaaoud had blown himself up or not. Abaaoud, a Belgian of Moroccan origin, was thought to have organised various other attacks, such as the foiled armed assault on a train in France in August. Investigators are still looking for another suspect, Salah Abdeslam, who is believed to have travelled to Belgium after the attacks on Friday night. The BBC’s Hugh Schofield in Paris says the identification of Abaaoud raises serious questions for security services.